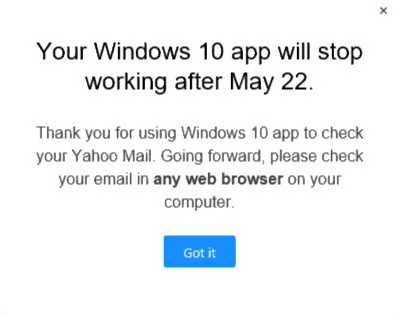 Yahoo is removing its mail app from the Windows Store. 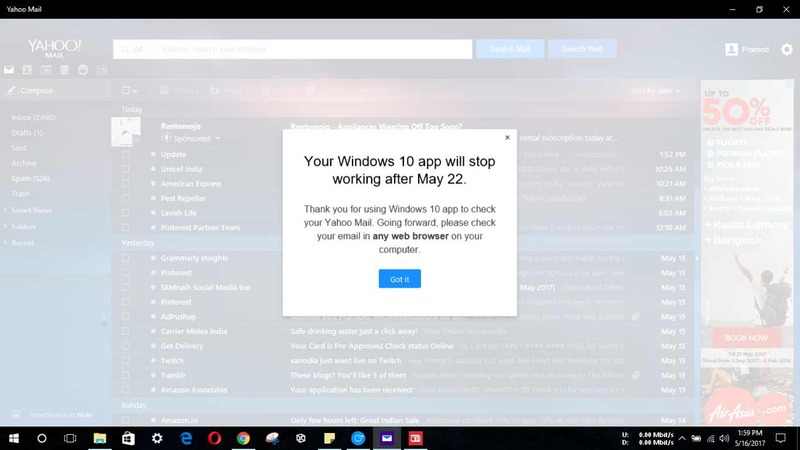 Today, the company informed its users on Windows 10 that the app will stop working after May 22. Going forward, you will require web browser on your computer to access the Yahoo mail. The app was first launched with Windows 10 in 2015 and has the ability to sync contacts, personalize themes, as well as real-time email info at a glance. Additional features include a Live Tile in the Start menu, organizational features, and sorting and searching options for easy access. This is a bad news for those still using Yahoomail. Recently, 1bn Yahoo accounts were compromised by biggest data breach in history. Last year, Verizon has acquired Yahoo for $4.8 billion. It’s a good idea to move on and look for something else which includes Outlook or Gmail.